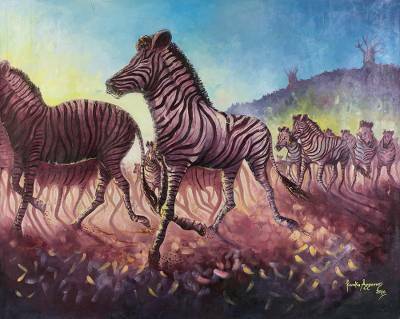 Original Acrylic Painting of Wild Zebra Herd at Dawn, "Stampede at Sun"
"Let us preserve and protect our wildlife for our own benefit as human beings," muses Ghanaian artist Lawrence Kwaku Agyeman. His sentiment is evident in this beautifully expressive and fluid painting of a herd of zebra in the early morning light. The dust being kicked up by their feet conveys their speed. On a hill behind them, two baobab trees loom large. Agyeman deftly captures the glow of sunrise and the freedom of wild creatures in this original acrylic on canvas painting. "I am inspired by fleeting moments of life that need to be recorded artistically. I am motivated to work when I see a blank canvas and an assortment of colors. Then my imagination goes wild!" "Painting is a talent I was born with, but it was refined through training in an art school. My work is a fusion of surrealism and abstract elements employed to depict the everyday activities of life. My adinkra symbols are innovations regarding their presentation. "I was born in Kumasi in the Ashanti Region of Ghana on April 5, 1967. "My work is a shift from the two dimensional, monochrome presentation of those symbols to more colorful, three dimensional paintings suitable for decorating spaces. It brings to life the iconographic interpretation of these symbols and I believe it makes them more meaningful and beautiful to look at. "My work evolved over time because – based on my understanding of their functionality – more visual elements have been introduced. "I am inspired by fleeting moments of life that need to be recorded artistically. I am motivated to work when I see a blank canvas and an assortment of colors and brushes. Then my imagination goes wild! I became a painter when the need to explore my artistic talents totally overwhelmed me. My greatest challenges in life include fatherhood as well as my quest to rediscover myself as an artist, an individual with many hidden and other yet-to-be-discovered abilities. I have taught my art to countless number of people and still do. "My favorite things in life include good music, good books, good movies, good food and good clothing. My family is made up of my wife and my three sons."